Manta rays are the largest species of ray and can reach up to a gob-smacking 8m in width. They evolved over 5million years ago and are a distant relative of our modern day sharks. They are a relatively young species compared to their ancestors, as sharks have been dated as far back as 400million years ago. Manta Rays are the gentle giants of the ocean and admired by many divers all over the world for their majestic elegance. Commonly they are mistaken as a type of sting ray. Though they are still considered a ‘ray’, evolution had them lose their stinger so they are completely harmless. The remnants of a stinger can still be seen on some manta rays as a small lump at the base of the tail. Sting rays generally have their mouths underneath their bodies as they feed on the sandy areas of the reef. As they began to move away from the reef and feed in the water column, manta rays evolved to form a large mouth at the front of their head. Almost everything we currently know about Manta Rays is thanks to Dr. Andrea Marshall, (aka The Queen of Mantas), who has spent the last 16 years researching them. In Nusa Lembongan and Penida Islands we currently have a healthy (and growing) population of more than 650 individual Manta Rays. Our local Manta Rays are currently under the close study of the Marine Mega Fauna Foundation who monitor a data base of our affectionately named resident Sea Flap Flaps. Manta rays are not to be feared as anything bigger than a few millimetres is simply not on their menu. These ocean giants feed on a diet of plankton, which are microscopic organisms they filter from the water. Manta rays can filter an incredible 80 tonnes of water per hour. To do so, they simply swim around with their enormous mouths wide open scooping up as much water as possible. To help them, they have a set of modified ‘Cephalic Fins’ at the front of their “face”. These fins helps to guide the water directly into their gaping mouths. When not in use, the cephalic fins are rolled up for better hydrodynamics. It is thought that Manta Rays might be most active at night when Plankton rises up from the deep ready to be fed upon by those gapping mouths. We do see them however during the day at Manta Bay and Manta Point where they actively snack on plankton during daylight hours. 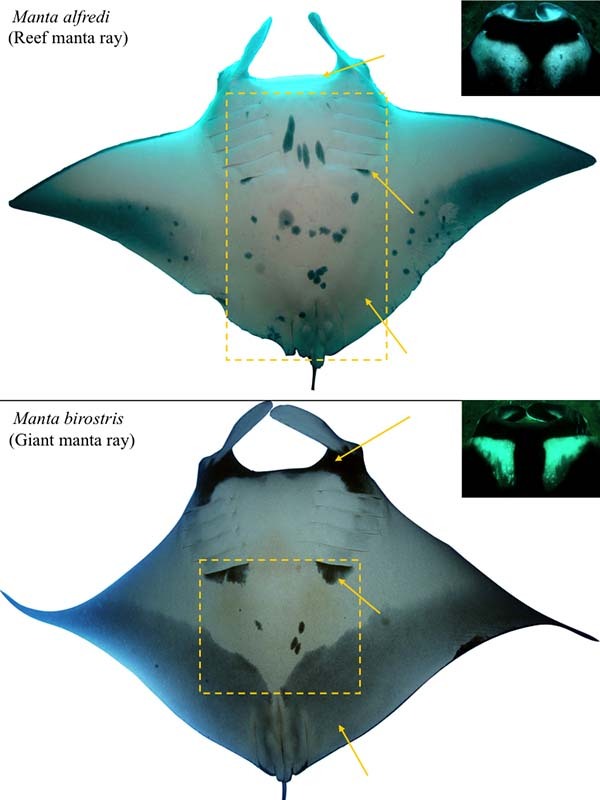 It is possible to identify mantas individually as each one has a totally unique spot pattern on its belly. This is the manta equivalent of a finger print. We can use photos of these markings to create a database and track the movements of any specific manta. The Marine Mega Fauna Foundation & Manta Matcher do just this. You can help with their research by uploading any photos you may have from any where in the world. Take a look at www.mantamatcher.org for more details and remember to have the details of your dives. Researching manta rays is very important as it allows us to be able understand them and better protect them from any threats. Mantas are found in temperate and tropical waters worldwide, generally between 35 degrees north and south of the equator. 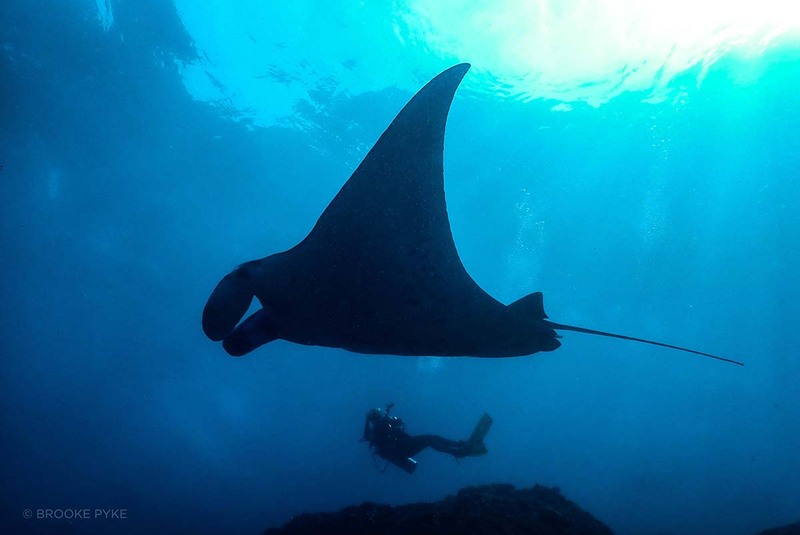 It is possible to dive with manta rays all year round in Nusa Lembongan. We see them almost daily at Manta Bay and Manta Point on the south coast of Nusa Penida. The manta rays visit Manta Point more often as we have a large rock rising to near the surface which the mantas identify as a cleaning station. What is a cleaning station? This is where mantas and other marine animals come to get their full body scrub, dental work and wound cleaning. There is a symbiotic relationship between the manta and some different types of cleaner fish. Fish such as sergeant major (facial experts), blue streak cleaner wrasse (gills & mouth) and yellow butterfly fish (wound specialists) can be seen cleaning. In retun for doing this hard work, the cleaning fish get a delicious meal of parasites and dead skin, (mmm tasty…). Good to know that this is a mutually beneficial relationship. 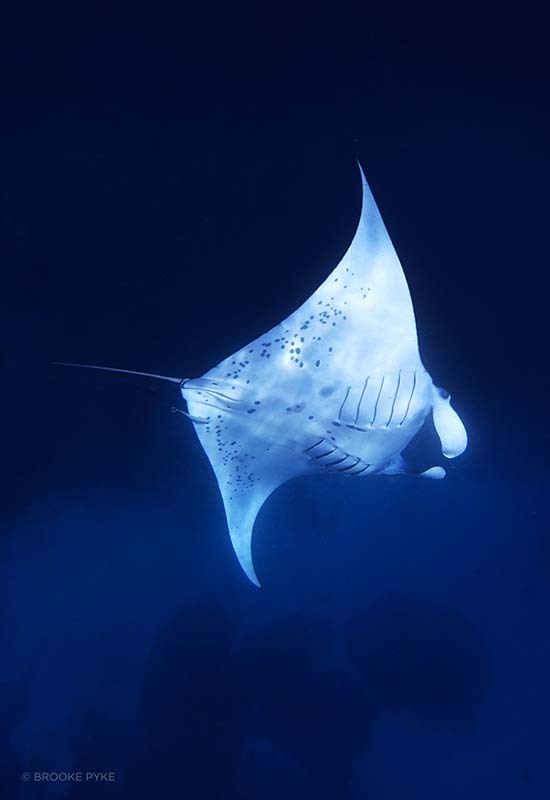 Mantas may spend up to 8 hours on the cleaning station per day. It is very important that when we dive with large marine animals like mantas (in fact all marine life) that we treat them with respect. This means keeping a distance, not entering a cleaning station and not chasing or blocking their access to a cleaning station. Manta rays cannot swim backwards so its important not to block their path. If you remain calm and stationary they will often come to you. If you are lucky, they will swim right over your head as they check you out. But first you must earn their trust and not appear as a threat. Never touch a manta ray, as just like all marine life and even corals, they have a layer of mucus on their skin. This mucus helps to protect them from infection. If you touch a marine animal, you removes the mucus. You can find manta rays in other parts of Indonesia and across the World. Thailand, the Philippines, Australia, South Pacific Islands, Mozambique, Red Sea and California all have populations. The largest populations occur in areas of upwelling along continental shelves, in island chains, and near seamounts. These areas typically have high a concentration of plankton where mantas congregate to feed. 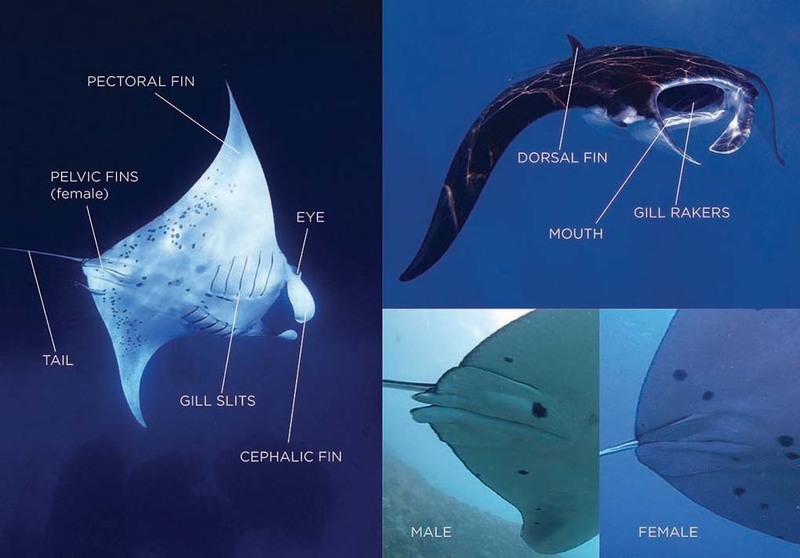 There are currently 2 described species of manta ray: Manta alfredi (Reef Manta) and Manta birostris (Giant Oceanic Manta). 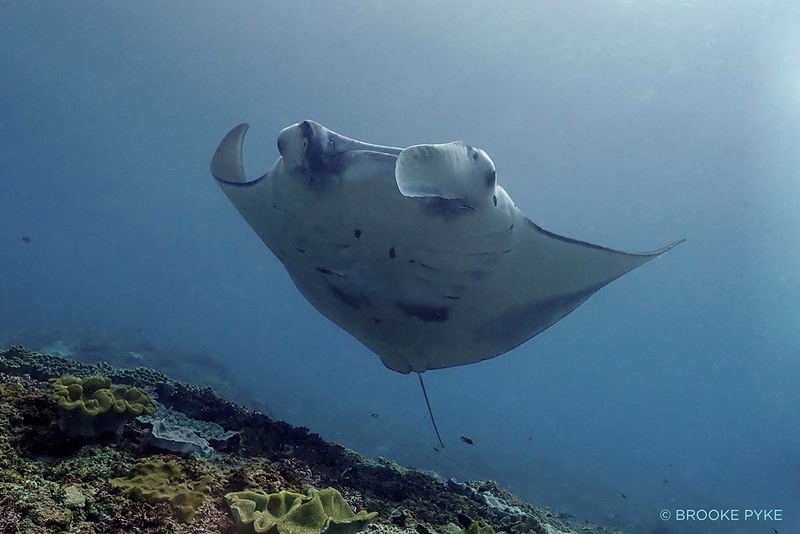 In Nusa Lembongan & Penida we have almost only the reef mantas. 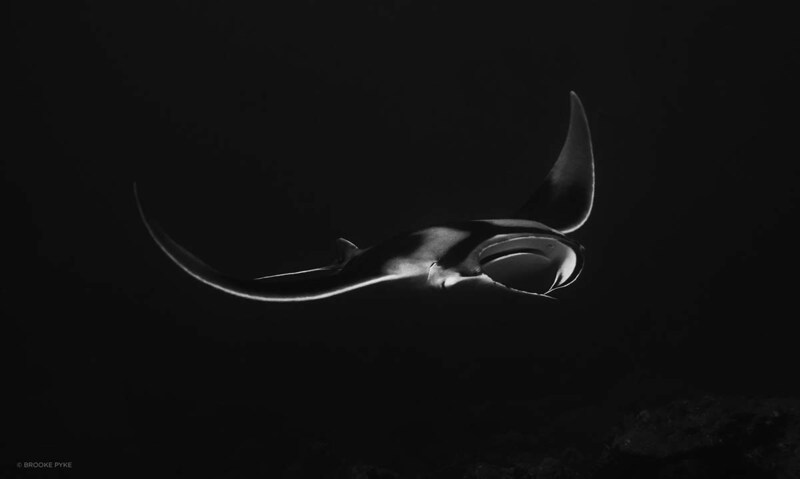 There have only been 3 confirmed/recorded sightings of seeing oceanic mantas in the area. Reef manta tend to be much smaller than their oceanic brothers and will range from 1.5m-5m in size (thats still pretty big!!!). Oceanic manta, on the other hand can grow to a whopping 8m wing span (wow!)! To tell them apart is not always easy unless you are familiar with them. Oceanic manta rays tend to have a very dominant black ’T’ shape on their back and they don’t have any spots between their gills. Reef manta have much paler markings on their bodies and often will have a lot of small dots all over their gill patch. 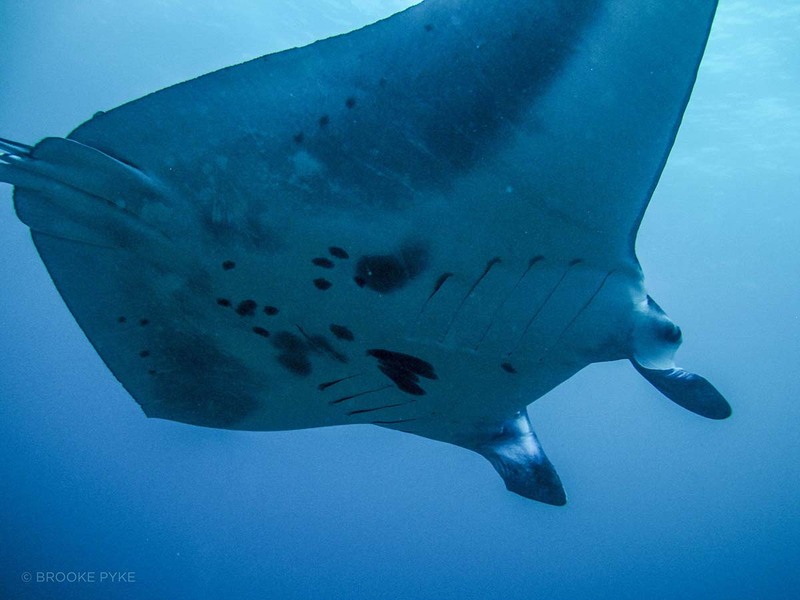 Manta rays are usually black on top and white on the bottom (see photos). But there are also melanistic, (completely black with some white spots), or leucistic, (almost totally white). Cool huh? Mantas have 5 sets of gill on each side. These evolutionary master pieces filter out plankton and 0xygen from the water. Manta rays are incredibly intelligent and social creatures. They have the largest brain to body ratio of any fish. Many divers have told stories of how the mantas seemed to interact with them and often can be quite inquisitive. Sometimes it’s as if the Manta is just as interested in looking at you, as you are of it. It truely is manta magic to experience such an intimate moment. Mantas reach mature breeding age between 6-10 years of age and a female will produce 1 pup every 1-2 years. This means that they reproduce at a very slow rate which is why it is so important to protect this species. Mantas give birth to live young which are already about 1.5m in size and come out like a little rolled up ‘manta burrito’. Gestation lasts for 12 months and there is still so much we don’t know about it. Manta birth has never been seen in the wild so we don’t even know where they go to give birth. Manta courting behaviour can be seen quite often in Nusa Penida and we do see quite a lot of pregnant females. Male manta rays will follow a fertile female around for up to 2 days. And not just one male…. she may be followed by a team of 20 or more males competing for their chance to breed! Once the female has chosen her mate, the male will ‘bite’ onto the tip of the females left fin and then the magic happens. Mating only lasts about 30 seconds after which they both their seperate ways. Due to their large size and manoeuvrability, mantas have few natural predators. Orcas and large, warm-water sharks such as tiger sharks have been known to prey on mantas. Their biggest threats come from human activity, illegal fishing, discarded fishing nets and lines and plastic pollution. But perhaps the biggest threat to mantas is fishing. 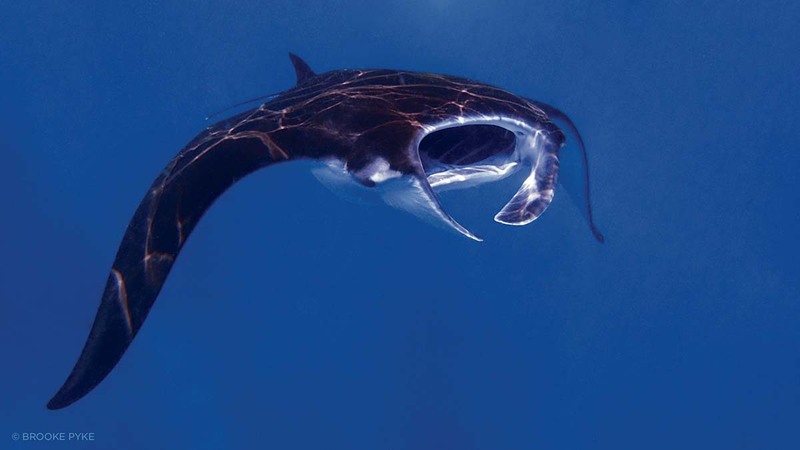 Their large size, slow speed, and tendency to be found on the surface make mantas an easy target. Elsewhere, mantas are often caught as bycatch. The gill rakers from manta rays are greatly sought after in the Chinese medicine market and they sell for about US $220 per kilo. Thanks to the hard work and of research of Dr. Andrea Marshal, mantas have now been listed on the IUCN red list as ‘Vulnerable’ to extinction. Which means more pressure can be put on governments to protect them. Come and dive Manta Point with Siren Diving! Next PostEELS, ALIENS OR EELIANS?